"CBT has reduced my cost of operations considerably. We used to spend much more time and money for parts that did not last anywhere near as long. The CBT parts are the best value we have found for our money." 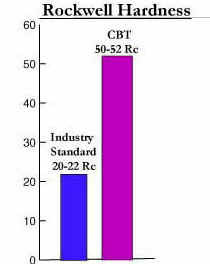 Wear parts constructed with CBT's 50 Rc steel have a life expectancy of at least two times that of the industry standard. The extended life expectancy offers our clients a long-term savings by reducing cost of goods and labor over time. Our special grade 50 Rc Steel has been metallurgically formulated to withstand the adverse conditions of daily wear and operation. Our wear parts are designed from this wear-resistant grade of steel. A514, the competitor's most common choice for like wear parts, is of a more structural grade. The composting, recycling, and waste processing industries demand tough machinery and wear parts for tough jobs. Here at CBT, we believe in bringing you the finest, strongest product that metallurgical technology can offer. We build our products from the highest quality material at a very competitive market price.